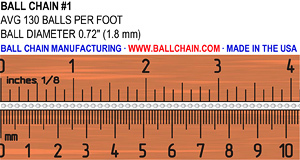 This is the smallest chain size available. Commonly used for fine jewelry such as necklaces and bracelets. .072" 1.8 mm 130 5 lbs. 12 lbs. CHECK 12 lbs.